The Ediacaran Period is an interval of geological time ranging 635 to 541 million years ago. It was a time of immense geological and biological change, and records the transition from a planet largely dominated by microscopic organisms, to a Cambrian world swarming with animals. It is therefore one of the most fascinating and unique periods in the history of life on Earth, and is of great importance to our understanding of how and why the earliest animals evolved and diversified. The base of the Ediacaran Period documents the end of a dramatic event in Earth's climatic history. The planet had suffered two major glacial events in the interval immediately before the Ediacaran, named the Sturtian and the Marinoan glacials. Each of these is thought to have lasted for several million years, and may have been global in their extent. Such severe glacial conditions would have cooled the planet significantly, and covered vast swathes of the oceans in ice. The severity of the events is a matter of substantial scientific debate, but they are often referred to as 'Snowball Earth' events (Hofmann et al. 1998). The second, Marinoan, event, ended about 635 million years ago. 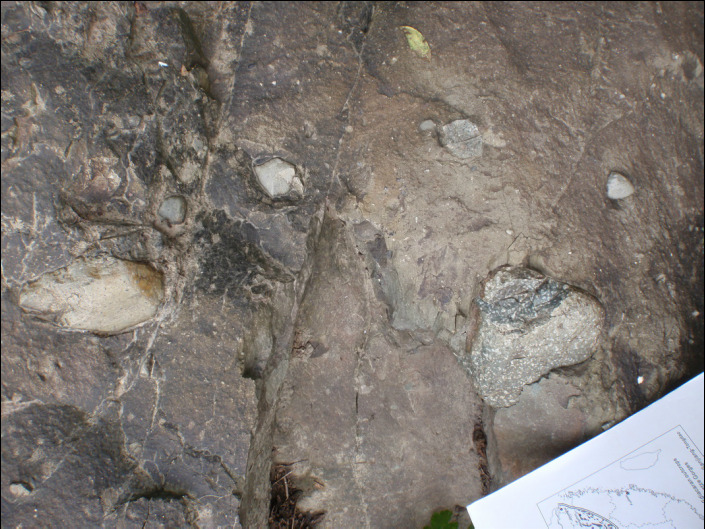 The glacial diamictite ('mixed rock') of the Nantuo Formation at Wuhe, South China. Large clasts of a variety of different rock types are interpreted to have been deposited by ice sheets extending off the continents, in glacial events that lasted for several million years. The planet was also undergoing a major rifting event, with the continental tectonic plates - which had formed a supercontinent called Rodinia around 700 million years ago - fragmenting and drifting apart (Li et al. 2008). The break-up of Rodinia led to significant volcanic activity, and the creation of large areas of shallow seas that may have provided ideal conditions in which life could thrive and diversify. Towards the end of the Ediacaran Period, another large landmass, Gondwana, began to form. These tectonic upheavals may have introduced large quantities of nutrients to the oceans, encouraging blooms amongst populations of planktonic organisms within the oceans. Perhaps most importantly for the development of the animal-dominated ecosystems that followed, during the Ediacaran Period the Earth's oceans became fully oxygenated. Prior to this, although the shallowest waters may have contained some oxygen, much of the deep ocean is thought to have been anoxic, and rich in sulfur and iron (e.g. Canfield et al. 2008). Such conditions would have been toxic to most higher lifeforms. However, during the Ediacaran Period, oxygen began to penetrate into the deeper oceans, and build up in both the water column and the atmosphere (Och & Shields 2012), so that by the Cambrian Period, oxygen levels were not only roughly similar to those today, but were also consistently stable. It is not clear what caused this rise in oxygen levels. Scientists have suggested cyanobacterial blooms, carbon and pyrite burial, or even the activity of the first animals themselves (Lenton et al. 2014) as potential contributing factors. Regardless of the cause, one of the main consequences of increased oxygen would have been significantly more habitable areas of the planet into which organisms that required oxygen for their metabolism could radiate and evolve. Against this backdrop of climatic, tectonic and geochemical change, the first communities of diverse large and complex organisms evolved and radiated around the globe. These organisms appear in the fossil record around 580 million years ago, and thrived in many environments right up until the basal Cambrian boundary at around 541 million years. Although they almost certainly included algae, protists, and some of the earliest recognisable animals, many Ediacaran fossils are unlike any known organism living or dead. The "Ediacaran macrobiota" therefore continue to represent some of the most intriguing fossils in the entire geological record (Dunn & Liu 2017).